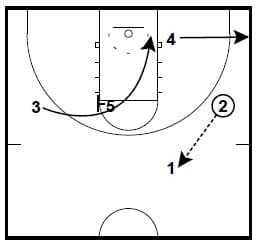 Today’s post contains two man to man plays from first year Illinois Coach Brad Underwood, formerly at Oklahoma State and Stephen F. Austin. Adjust these sets to fit your players and philosophy and/or take bits and pieces to combine with what you already run against man to man. The plays are from The Faces in New Places 2017 Playbook assembled by Chris Filios. Play Starts in a 2-3 High Alignment. 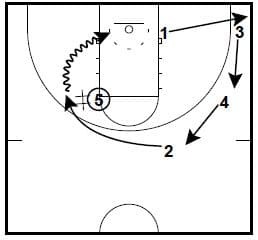 4 then cuts off a back screen from 5 at the elbow opposite the ball. 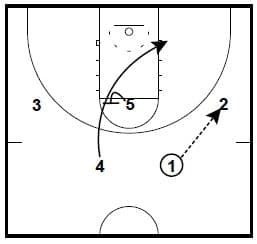 If 4 is open, 2 can hit him for a layup or a post isolation. This will not be open very often. 4 clears to the corner. 3 curls off of 5 at the elbow. 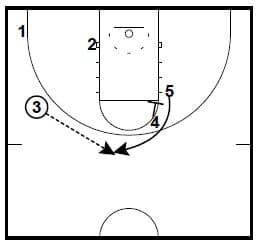 If 3 is open for a layup or post up, 2 will make that feed. *Note, you could also make a call for a pass to 5 for a clear out in several of these frames if that is an advantage that you have. If 3 is not open, 2 passes back to 1. 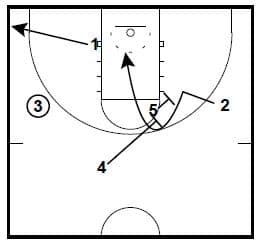 1 passes to 5 at the elbow and cuts off 5 for a Hand Off opportunity. If available, 5 should hand off to 1. As this action is taking place, 2 replaces 1, 4 replaces 2, and 3 moves to the dead corner. If 1 does not get the ball on the hand off, 2 follows for a second hand off opportunity. 1 cuts off a screen from 5. 3 will pass to 1 if there is an opportunity to score. 1 clears to ball side corner. 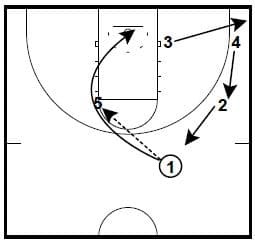 2 curls off a screen from 5. 4 screens down for 5. 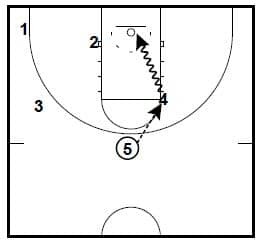 5 curls to the top of the key off the screen. 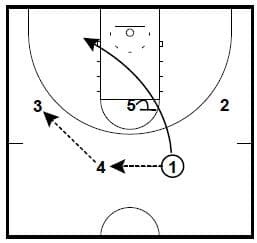 5 passes to 4 for an isolation opportunity for 4. The playbook contains 200 basketball plays from Division 1 Men’s coaches who are at new schools for 2016-17.